Want to learn more about Promotion and Tenure Policies and ePortfolio? 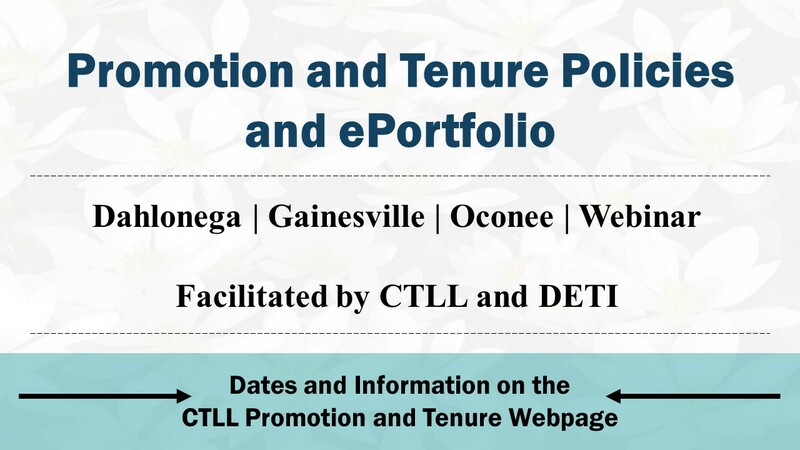 The Center for Teaching, Learning, and Leadership (CTLL) and Distance Education and Technology Integration (DETI) are offering workshops and webinars on Promotion and Tenure Policies and ePortfolio that will provide an overview of UNG policies and technology. The next workshop is scheduled for Wednesday, February 28, 2018, at the Dahlonega Campus in the Library Technology Center 380, from 12:00-1:00 p.m.
On Tuesday, March 20, 2018, a workshop will be held on the Gainesville campus in Nesbitt 3203 from 12:30-1:30 p.m. If you are unable to attend the face-to-face sessions, two webinar sessions will be available on Tuesday, March 20, 2018, and Wednesday, June 13, 2018. 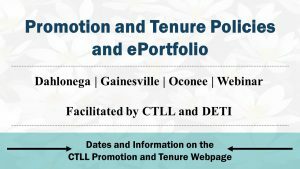 For more information about the Promotion and Tenure Policies and ePortfolio workshops and webinars, visit Promotion and Tenure webpage.